The island of Cuba has a great many traditions. With its distinct blend of Spanish and African heritage, Cuba bustles with energy and its citizens are friendly, easy-going and very passionate. One passion that pervades the Cuban society is chess. The birthplace of former World Champion José Raúl Capablanca, chess has kept its affection toward the royal and has of late produced many talented players like GM Lenier Dominguez and former World Junior Champion, GM Lázaro Bruzón. However, several players served as a buffer between Cuban players of past and present. One of these figures was an Afro-Cuban master named, Rogelio Ortega. Rogelio Ortega was born March 28th, 1915 and competed with many of the top players in the world in his day. As a National Champion and Chess Olympian, he is considered somewhat of a hero in Cuban chess circles… a tournament is named for him. One of the earliest accounts of his play was his splendid performance at the 1959 U.S. Open in Omaha, Nebraska. He scored 8½ points in a tournament won by GM Arthur Bisguier with 10. He competed in many Cuban National Championships winning the crown outright in 1966 and placing =2nd in the 1969 contest. Click below to see the crosstables of two Championships. Perhaps one of the proudest moments was Ortega's representation of his country in the legendary 1966 Chess Olympiad held in Havana, Cuba. Another highlight of his career occurred in a 1967 tournament in Poland. The tournament was in SZACHY magazine (in Polish of course) and featured a group photo which you will find below. 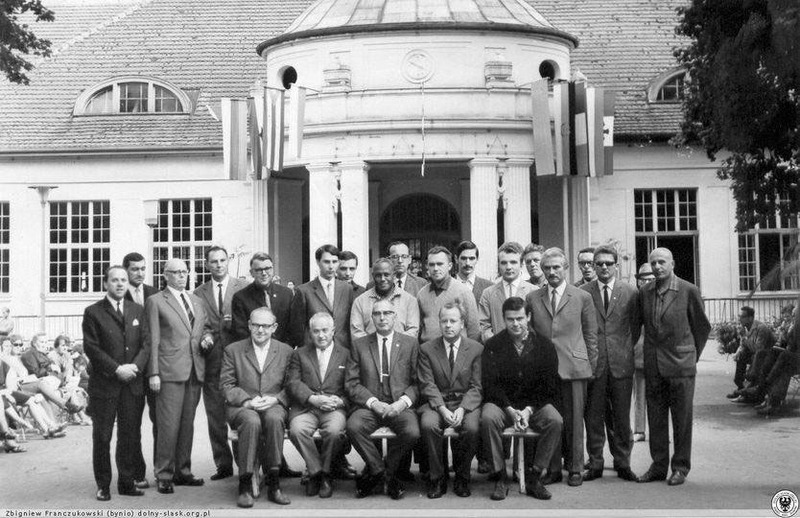 While Ortega finished 15th out of 16 players, he defeated Soviet Union's GM Seymon Furman and Germany's GM Wolfgang Uhlmann, two of the world's elite players at the time. GM Furman won the tournament while GM Uhlmann placed =2nd with GM Vlastmil Hort of Czechoslovakia (now the Czech Republic). Unfortunately neither of Ortega's wins appeared in the magazine, but are catalogued in the ChessBase.com database. His opponents represent a Chess Hall of Fame and include: Tal, Spassky, Smyslov, Geller, Portisch, Reshevsky, Najdorf, Rossolimo, Bronstein, and Horowitz. Polanica-Zdroj, 1967. Seated (L-R): Furman, Flohr, Euwe, Uhlmann, Hort. Standing (L-R): Arlamowski, S. Witkowski, Graetz, Horbacki, Orbaan, J. Schmidt, J. Adamski, R. Ortega, Kalarow, Filipowicz, Suttles, Liebert, Sliwa, Kuszewski, Kozlowski, Kostro, Turski. One interesting footnote is that Master Ortega once conducted a simultaneous exhibition in June 1962 and the legendary Ernesto Ché Guevara sat to match wits with the Cuban chess legend. 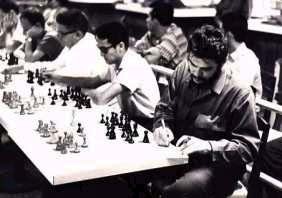 It is well-known that both Guevara and Fidel Castro were fairly strong chess players. The game lasted only 22 moves… but it was Guevara who brought the game to an abrupt end after Ortega blundered a piece!! Master Ortega was instrumental in developing opening theory in the Poisoned Pawn Sicilian! He also excelled in combinations as evidenced by the example in shown in this month's feature of "Chess Crackers." One can only imagine the type of player that Ortega was in his prime. Looking at his games, one can surmise that he relished the chance to enter into complications… usually pressing forth in the attack. With his apparently easy-going persona, one could only imagine why he is such a popular figure in Cuban chess history. He certainly has made Cubans proud as he has those of his brothers and sisters of African descent. With that said it is befitting to honor this world class player with the highest regard and he will placed on the list of Drum Majors as a Master Emeritus. Bravo Maestro Ortego!!! Ortega- Larry Evans, 1952, 0-1. Ortega - Svetozar Gligoric, 1952, 0-1. Larrea Soto - Ortega, 1952, 0-1. Ortega - Franz Auer, 1952, 1-0. Ortega - Ludek Pachman, 1962, ½-½. Ortega - Brinck-Claussen, 1962, 1-0. Boris Spassky - Ortega, 1962, 1-0. Andrzej Filipowicz - Ortega, 1962, 0-1. Ortega - Gilberto Garcia, 1963, 1-0. Ortega - Lajos Portisch, 1964, ½-½. Ortega - D. Castellanos, 1965, 1-0. Milan Matulovic - Ortega, 1965, 1-0. Nejib Bouaziz - Ortega, 1966, 0-1. Ortega- Seymon Furman, 1967, 1-0. Duncan Suttles - Ortega, 1967, 1-0. Ortega - Wolfgang Uhlmann, 1967, 1-0. Ortega - Istvan Csom, 1968, ½-½. Ortega - Oscar Trujillo, 1968, 1-0. Cubana Federacion de Ajedrez, www.cuba.cu/ajedrez/boletin/teoria34.html. Ajedrez en Cuba (Chess Bulletin), March 1998, No. 15. Ajedrez en Cuba (Chess Bulletin), March 1998, No. 16. Ajedrez en Cuba (Chess Bulletin), July 1998, No. 23. Note: Sincere thanks to Jim Kulbacki for bringing Maestro Ortega to my attention and also providing copies of the SZACHY article.